Development of advanced separations technologies, radical process innovation, simulation, and synthesis to reduce capital and operating costs in the chemical and polymer industries. Discovery, development, scale-up, and commercial production of “best-in-class” heterogeneous and homogeneous catalysts for batch and continuous processes. Process and product pilot plant, demonstration unit scale-up, and technological verification to achieve reduced cycle times and commercial risk mitigation. MATRIC offers a full range of laboratory services for solids processing, including various types of crystallization, solid/liquid separation, including centrifugation and filtration, and vacuum and convection drying. Services include the capability for conducting laboratory and/or pilot scale precipitation, crystallization, and product recovery studies suitable for scale-up to commercial operation. Emphasis on development of processes based on biomass and renewables. Identification and techno-economic analysis of emerging process and product technologies. MATRIC personnel have considerable experience in the design, formulation, and introduction of new commercial products. 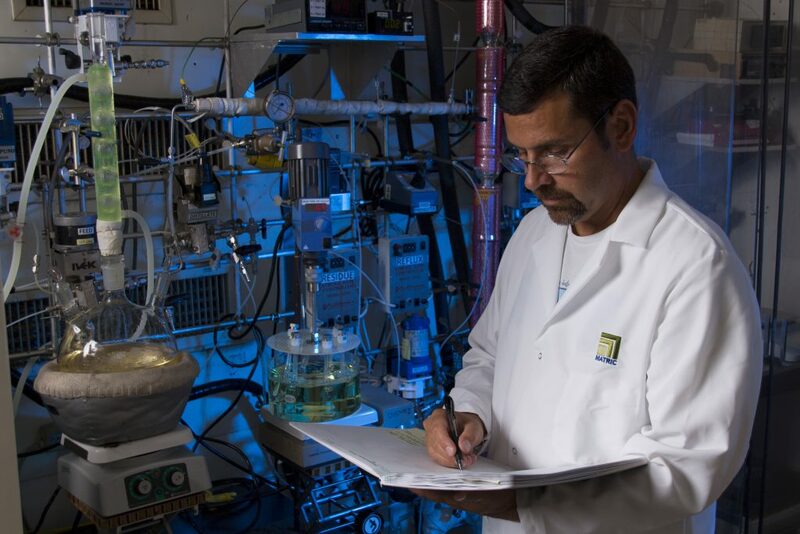 MATRIC has broad expertise in environmental technologies, including environmental characterization experience and techniques, water treatment technologies, and processes for reducing the environmental impact of natural gas and coal production. MATRIC offers a full suite of safety services, including reviews, analyses, incident investigation, program and plan development, modeling, audits, and training. These capabilities will help an organization reduce the risks associated with a variety of industrial and laboratory operations. Generation of intellectual property and its leveraging to create unique value and sustainable competitive advantage. Plant operations improvement and process support, including increased yield, capacity, asset utilization, product quality, reliability, inherent safety and reduced energy usage, and lower environmental impact. Business strategy and technology plan development for successful market introduction of new products, processes, and technical services. MATRIC is a non-profit contract research and development firm with proven expertise in chemical process technologies, research and development, and scale up services for the chemical industry. Working alongside MATRIC allows chemical and energy companies to quickly launch development projects, overcome technical challenges, minimize long-term capital and operating costs, and anticipate and control risk.